Note: The upgrade process cannot be rolled back automatically. We recommend that you have an up-to-date archive of your settings before you start in case you wish to revert to an earlier version. For a detailed description of how to take an archive, see Managing Archives. 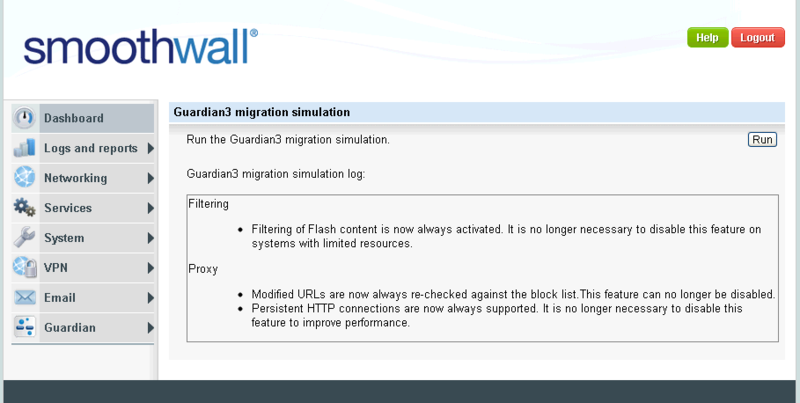 The Migration Simulation tool is designed to enable you to see how migrating your current content filtering settings would be affected if you upgrade to Guardian from SmoothGuardian. When run, the tool reviews your current SmoothGuardian settings and lists how your settings would be affected and any changes you would need to make if you upgrade. The tool makes no changes to your system. The Guardian3 migration simulation page opens. Your Smoothwall runs the tool and displays the results of simulating the migration. Tip: You can select and copy the results and paste them in to a text document for future reference. 3. When you have reviewed the results, you can proceed with the upgrade.  All the latest updates downloaded and installed on your Smoothwall. For a detailed description of how to do this, see Installation Prerequisites . 1. From a web browser, log on to your Smoothwall. 2. Go to System > Maintenance > Modules. 3. Click Refresh module list. 4. In the Available modules panel, locate Guardian3 and click Install. Your Smoothwall installs the latest version and migrates your current settings. The next step is to reboot. 5. Go to System > Maintenance > Shutdown, select Immediately and click Reboot. Once your Smoothwall has rebooted and you have logged on, you can review the changes. 6. Go to the Guardian > Getting started with policies page and click Migration log to view the list of settings that have changed or been migrated. We recommend that you make a note of any changes that need to be acted on. 7. Click Close to close the window and access Guardian.